I'm not a spec of Irish but I was born on St. Patrick's Day and tend to celebrate the day - often with a green beer. 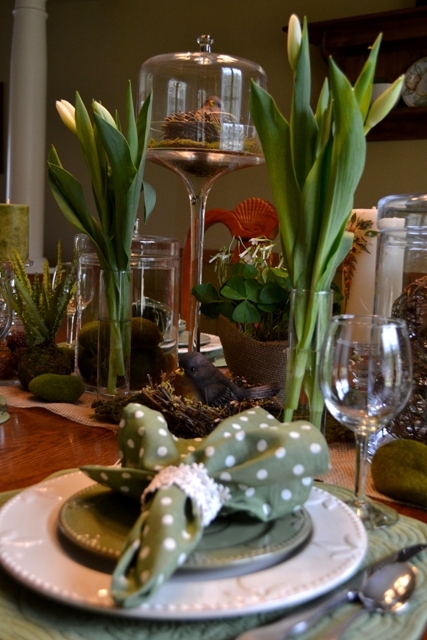 My tablescape is not really a beer drinking kind of setting but a lot of green with a bit of clover. 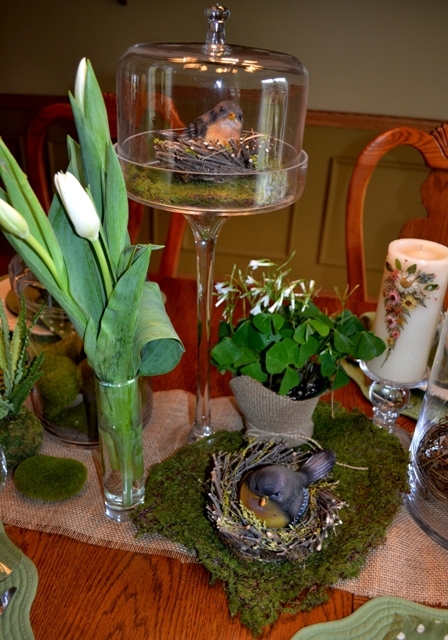 This is my first tablescape and I hope you enjoy it. 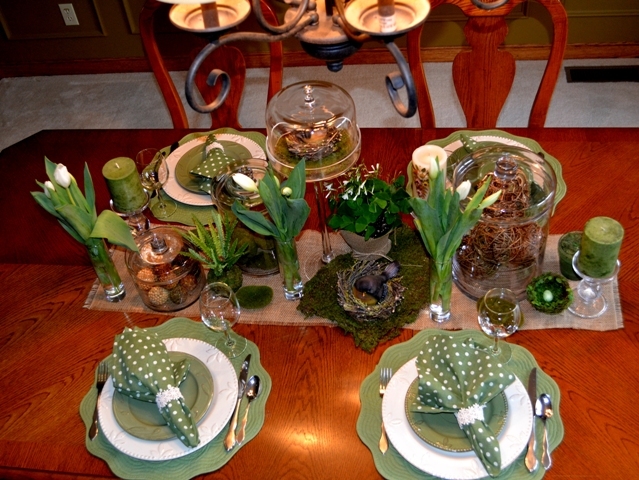 I had the Sorrento dishes and all of the glassware and containers already. I purchased the placemats (4 for $12.99) and napkins (a steal at 4 for $4.99) at Homegoods. The burlap I used for my runner was left over from my mantle banner. I also wrapped the pot of clover with the scrap I had left over. I made the napkin rings from an old piece of cluny lace I had and a toilet paper tube. So simple. 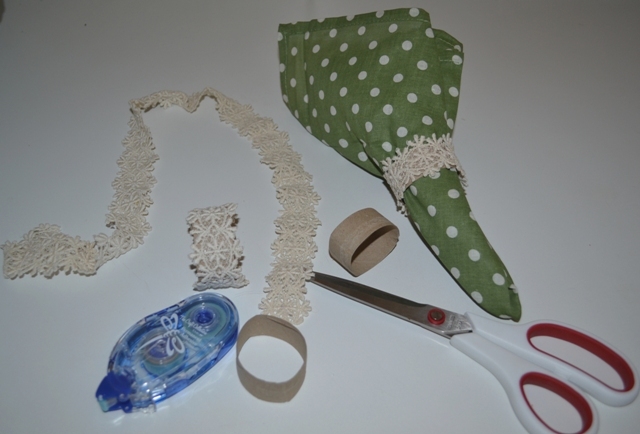 Just cut the tube up, ran my tape runner around the cardboard and adhered the lace to the tube. It was a little less than 6" of lace for each ring. I found some moss accessories at various places - the rocks were from Marshall's ($7.99), the fern ball from Pat Catan's ($4.89). 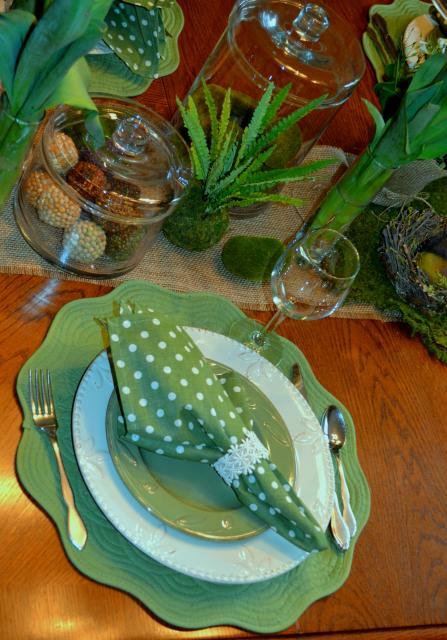 The Moss placemat was from a little shop in Amish Country in Ohio. A new meaning to Going Green! Thanks for stopping by! 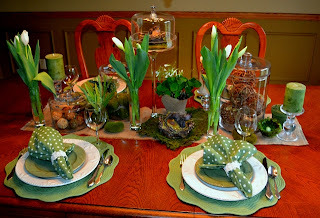 I am going to try my first Tablescape Thursday posting at Between Naps on the Porch. I have a link to the site on the right - if you love tablescapes this is a fun blog to check out. 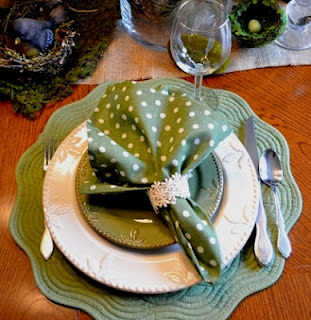 Lace over a TP tube as a napkin ring? Just genius!